William Ewart Gladstone reportedly once said “show me the manner in which a nation or a community cares for its dead. I will measure exactly the sympathies of its people, their respect for the laws of the land, and their loyalty to high ideals”. Although it has been disputed whether or not Gladstone was the originator of this statement, it did have bearing on the development of a newly incorporated city in 1896. Prior to incorporation, Miami was not much more than a trading post with very few people. The manner in which the inhabitants buried their dead were crude and unsustainable. The approach to burial and funeral service changed with the arrival of several early pioneers to Miami. After the announcement that Flagler would extend his railroad to the shores of the Miami River, many people began to flock to the soon to be incorporated city in order to find new opportunity. One of these people was Edwin Nelson. He arrived in the early months of 1896 and opened a furniture store and undertaking service in May of 1896. The store was located in a small wood frame building on the west side of North Miami Avenue and NW First Street by today’s street names. Nelson sold plush, covered parlor suites and polished wooden coffins. During this time, it was common to find funeral parlors within furniture stores. Furniture stores not only provided furniture, but were the most logical place to provide caskets. Naturally, Nelson chose to open his business as both a furniture store and funeral parlor. From the records of the Miami City Cemetery, it is documented that Edwin Nelson made the first interment of H Graham Branscomb on July 20, 1897. The Miami City Cemetery was created with land sold to the city by Julia Tuttle in June of 1897. Prior to the opening of the cemetery, interments were made in churchyards and the old Larkin Cemetery in South Miami. The founders believed that there needed to be a cemetery closer to downtown Miami, which prompted Tuttle to grant the land located between NE 18th and 19th Streets and between NE 2nd Avenue and North Miami Avenue (all by today’s street names). 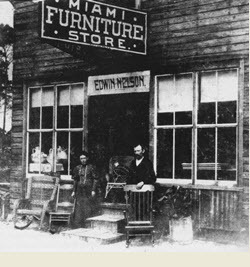 Given the rapid growth of his furniture business, Edwin Nelson decided to sell his undertaking and funeral parlor in 1903. He sold it to W.F. Miller who moved it to 413 Twelfth Street, now known as West Flagler Street. Miller operated the funeral parlor, in conjunction with his boating and fishing enterprises, until 1906. Another early pioneer also got into the funeral business. HM King arrived in the latter part of 1897. Having been a printer by trade, King opened the King Printing Company. This business operated on today’s southwest corner of South Miami Avenue and First Street. Looking for ways to grow his business in the latter part of 1898, King decided to open a funeral parlor and undertaking service in conjunction with his printing business. By the time his funeral parlor was in business, King was responsible for interment number 37 in the Miami City Cemetery on February 13th, 1899, for Mrs. ME Budd. By 1901, King needed help in his growing business. It was at this time that he hired a young Spanish American War veteran who had hospital experience in the service and had some prior experience working for his competitor, Edwin Nelson. 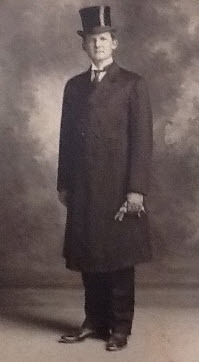 The name of this young man was Walter Hughes Combs Sr.
Walter was born on April 27th, 1876, in Hayesville North Carolina. When he was a young boy, his parents moved to Orange County, Florida, where they planted orange and grapefruit groves. Once of age, Walter was sent to Atlanta to attend business college, and then on to Cincinnati for a course at the College of Embalming. After school, Walter worked for the Louisville and Nashville Railroad as a shipping clerk for several years and then returned home to help his father with the groves. He married Lorena Jaudon of Orange County in 1899. Lorena was the daughter of a pioneer Florida family. The young Combs decided to take a chance on a new city and moved to Miami in 1900. Walter became assistant chief of the Miami Fire Department for a year after helping organize the unit. He also served as the sanitation inspector for the city during its founding years. As a side job, Walter began to work for HM King in his funeral parlor. By 1903, while working for HM King Undertaking Company, Combs decided to make this his profession. He returned to Cincinnati and attended the Clark School of Embalming to complete his certification. Once he finished, he became one of the first embalmers in the State of Florida and the youngest embalmer in South Florida. On January 9th, 1904, General John B Gordon, a famous confederate officer, died at his winter home in Miami. He was a veteran of the battles of Sharpsburg, Chancelorsville, Gettysburg, Appomatox and many others. He commanded the left wing of General Robert E Lee’s army at Appomatox. General Gordon had emerged from the war as one of the greatest southern heroes. HM King was given the job of preparing the general’s body for travel back to Atlanta. It was Walter Comb’s job to accompany the general’s body once it was prepared for travel. It was during this trip that Walter began to understand the pomp of the military. Henry Flagler provided a railroad car for the trip. Although Combs had served time in the army during the Spanish American War, he had not seen this type of lavishness and pageantry to accompany the departed. He knew he had chosen the right path and knew that it wouldn’t be long before he set out on his own. In 1906, WF Miller decided to exit the funeral business to concentrate on his boat and fishing business. At that time, the funeral parlor had been moved and was located at SE First Street between South Miami Avenue and SE First Avenue. On July 2nd, 1906, Walter Combs bought the business. Considering that he was buying Nelson’s funeral business, Walter made the claim that Combs Funeral Service was the first and oldest in Miami. It is likely that HM King took exception to that claim since he had the oldest funeral service to operate under the same owner. Walter continued to run the funeral parlor from the same SE First Street location until 1910. At that time, he rented a building across the street from Burdines. In those days, it was common to provide funeral services in the commercial districts. Although embalming was done in the funeral parlor, it was also common for most wakes to occur at home and services to be conducted at church. 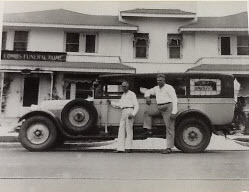 In 1912 Walter Combs established the first resident style funeral home in South Florida. This was a large white wood framed house at the southwest corner of NE First Avenue and Second Street. Today, this would be just west of Gesu Church on NE First Avenue. The home was equipped with a curtained hearse that was drawn by two black stallions to complement the tone of a funeral. Shortly after moving into the funeral home, Combs purchased the city’s first motorized funeral and ambulance equipment. Comb’s Funeral Service was moved out of Miami’s first funeral “home” to 1539 NE Second Avenue in 1923. This location was most likely considered more desirable because it was a short distance to the Miami City Cemetery. Later, the Combs Funeral Service expanded to having funeral homes on Miami Beach and Coral Gables. By the mid-1960s, Combs only operated funeral homes at the NE Second Avenue and Coral Gables locations. Walter was from a big family and had four brothers. While it is not clear if any of his brothers had ownership interest in Walter’s enterprise, it is known that at least two of his brothers worked in the funeral business. One of his brother’s was my great grandfather, Jay Combs Jr., who worked in a variety of roles for Combs Funeral Home in the 1910s. In addition to his brothers, Walter intended his business to include his children. Walter H Combs Jr, the eldest son, was admitted as partner in 1921. His other sons, Jack and Paul, became partners in 1926 and 1934, respectively. Walter’s only daughter, Lorena Combs Lund, became a partner in 1939. Walter Jr. ran the day to day business while Walter Sr. tended to his many civic duties. Jack and Walter Jr. gained notoriety for valiant service during the 1926 and 1928 hurricanes. Walter Jr. identified the dead in 1926 and made sure that all of the victims received a dignified burial. 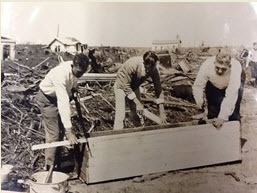 The Combs had to utilize the debris from the storm just to ensure victims had coffins. There were many of Miami’s pioneers and noted dignitaries that were served by the Combs Funeral Home. In a Miami News article on October 17th, 1965, Paul Combs recalled the most lavish funeral Combs ever conducted as that for Laurie Wever. Wever was a Miami motorcycle policeman who was shot down by a gangster on March 15th in 1925. He was given a heroes funeral including a procession of policeman marching and riding along with a float providing a floral tribute to the fallen officer. Other notable funeral services included Dr. James Jackson, who requested that his grave be marked by the hitching post where he tied his horse between house calls, Roddey Burdine, Miami Mayor E.G. Sewell and Carl Fisher. Fisher’s funeral was held outdoors in front of the Miami Beach Public Library. Loud speakers were installed so that the throngs of attendees could hear John Oliver La Gorce deliver the eulogy. La Gorce was a long-time friend of Fisher and publisher of National Geographic. He was also very close with James Allison, another prominent builder of Miami Beach and close friend of Carl Fisher who died in 1928 in Indianapolis, Indiana. Combs provided funeral service to a couple of gentleman with unique circumstances. In May of 1927, William Palmer died at the age of 78 at the weight of 300 pounds. At one time, Palmer weighed over 500 pounds and was given the name of “Fatty” Palmer. He was remembered by pioneer Miami families as the very large man that sold trinkets outside the post office on NE First Avenue. He was so large, Combs had to build what was considered the largest custom made coffin in Miami’s history. It was 6 feet long, 50 inches wide and 22 inches deep. Just a few years later, Combs needed to create an even larger casket for the circus giant, Carl Gulliver. Gulliver died on June 25th in 1930. He was 8 feet 3 inches tall. In preparation for his funeral, Combs had to once again create a custom casket to accommodate the body of Gulliver. However, the casket now wouldn’t fit properly into the hearse. The casket was partially protruding from the hearse in route to the cemetery. The legacy of Walter Combs Sr. goes well beyond that of pioneer business owner. Walter Sr. was also an active civic leader in the early Miami community. According to the October 17th article in the Miami News, he was a member of the Dade County School Board for three terms, a member of the Rotary Club and a Boy Scout Commissioner. Through the years he added a number of other civic responsibilities and fraternal organizations to his busy schedule including: Dade County Planning Board, Rod and Reel Club, Scottish Rights Masons, Elks, Spanish War Veterans, Knight Templars and others. While the funeral business thrived for the Combs family, members of the family began to join those Miami pioneers that they interred into the city cemetery through the years. Walter Sr. passed away on January 5th, 1942. His son Jack passed away in February of 1963. Walter Jr, Paul and Lorena continued to run the family business until the early 1970s when they sold the business to Ken Bess. The funeral homes operated under the name of Bess-Kolski-Combs for a while until they were later renamed to Bess Memorial Funeral Home. 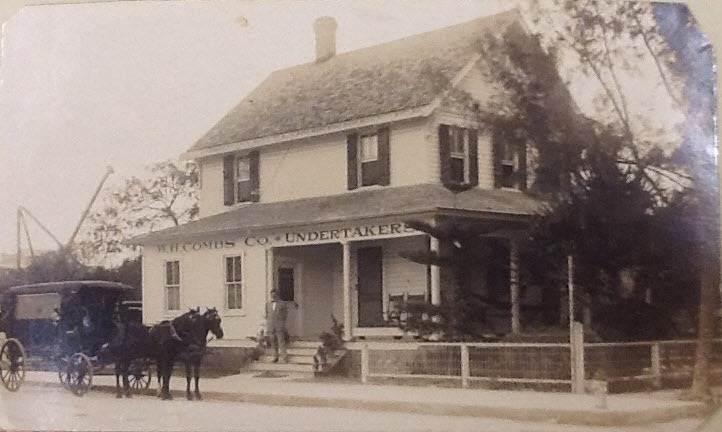 It is unclear how long the Combs Funeral Home locations remained in business, but they were no longer operated by the Combs family after the early 1970s. Today, the flagship funeral home located on NE Second Avenue is no longer there. The location is a parking lot that will no doubt be converted into the next high rise project in the Edgewater neighborhood. While the Combs name is no longer prominent in the funeral business in Miami, the Combs family maintained the high ideals described by Gladstone for close to 70 years. They strived to provide “service to the living while properly and reverently caring for the dead”. Be the first to comment on "Miami’s Pioneer Funeral Home"